NASA astronaut Sunita Williams, Expedition 32 flight engineer, appears to touch the bright sun during the mission’s third spacewalk on Sept. 5, 2012. In legend, the bright sun was a dazzling temptation for Icarus and so, too, it is for NASA astronaut Sunita Williams, who appears to touch our closest star in a photo snapped during a spacewalk this week. But unlike Icarus, the boy who flew too close to the sun and fell back to Earth when his wax wings melted, Williams revels in the sun's bright light while floating outside the International Space Station. 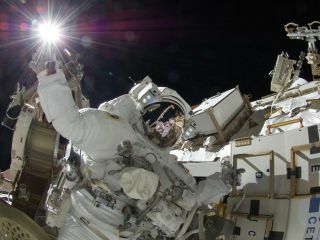 The image was taken during a spacewalk to finish repairs on a vital power unit on Wednesday (Sept. 5). The photo shows Williams, a flight engineer with the station's Expedition 32 crew, in a spacesuit appearing to grab the sun with her right hand during a break from space station repairs. Her crewmate Akihiko Hoshide, of the Japan Aerospace Exploration Agency, snapped the spacewalk photo during a rest break. If you look close, you can see a reflection of Hoshide taking the picture in the faceplate of William's helmet. Williams and Hoshide spent six hours and 28 minutes working to remove a stuck bolt using improvised tools made from spare parts, including a toothbrush. The bolt got jammed during a marathon eight-hour spacewalk on Aug. 30 by the two astronauts, and prevented the replacement of a main bus switching unit, which routes power for the space station systems. With the new tools in hand, this week's spacewalk went smoothly and the astronauts replaced the power unit, as well as a broken camera on the space station's robotic arm. Wednesday's excursion marked the sixth spacewalk for Sunita Williams, who will soon take command of the space station's Expedition 33 crew. It was the second spacewalk for Hoshide. The space station is currently home to six spaceflyers representing Russia, the United States and Japan.